After taking two of three in Kansas City, the Yankees get to face another last-place team as they travel to Texas. Masahiro Tanaka and the Yankees coughed up a 5-1 lead in the series opener, losing handily, 11-5. Tommy Kahnle and Caleb Smith struggled in relief. Luis Severino dazzled in Game 2 but left trailing 1-0. However, the Yankees rallied for three runs in the final two innings for a narrow 3-1 win. Tyler Austin had the go-ahead 1B in the ninth. Aaron Judge and Gary Sanchez each hit two monster homers in the series finale and the Yankees obliterated the Rangers, 16-7. For more information, check out Katie’s Yankeemetrics post on the series. Elvis Andrus is on the 60-day DL with a fractured right elbow. Adrian Beltre is on the 10-day DL with a left hamstring strain. Cole Hamels missed his last start with neck stiffness but is scheduled to pitch on Tuesday. Tim Lincecum is on a rehab assignment after dealing with blisters. Lefty starters Matt Moore and Martin Perez are both on the disabled list with right knee soreness and right elbow discomfort, respectively. The Rangers come into this series at 18-30. That’s good for last place in the American League West and has them a good 7.5 games behind fourth place in that division. This team is a shell of the squad that seemed in line to rule the AL just a half decade ago. The team is 26th in pitching fWAR and has a 4.73 team ERA while they’re even worse offensively, putting together a .229/.299/.384 (80 wRC+) batting line and 0.7 fWAR from their position players. They strike out more than anyone and are in the bottom third in walk rate. Welp. 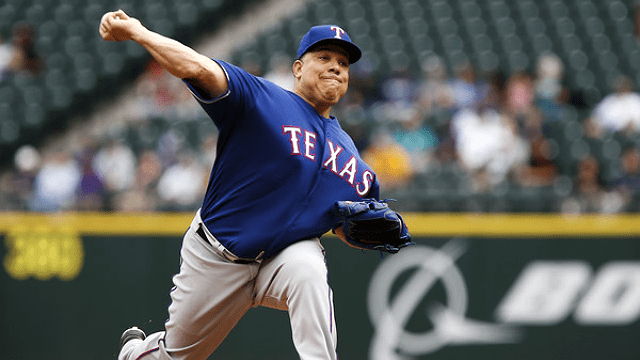 Bartolo Colon is good again! The former Yankee will turn 45 years young on Thursday, but he’s pitching just as well as he did a half dozen years ago. He’s going for a milestone in this one as he is one victory away from his 243rd win, which would tie him with Hall of Famer Juan Marichal for the most by a Dominican born pitcher. This has been a major career goal for the ageless wonder known as Big Bart. Colon was downright bad last season, sporting a 6.48 ERA over 143 innings with the Braves and Twins. But he’s rebounded and has a 2.82 ERA in 51 innings with the Rangers. How has he done it? He’s issued just four walks and has a 0.843 WHIP. He’s gonna throw the ball over the plate with his upper 80s fastball and dare you to hit it. The Yankees just happened to get the Rangers’ three best starters this series and Hamels is likely their best. He’s certainly their highest paid with his seven-year, $159 million deal running through this season. He’ll be a popular trade deadline candidate and the Yankees have already been mentioned as a potential suitor. 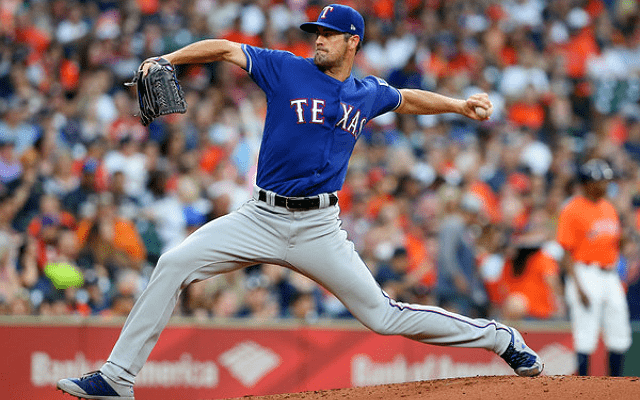 At 34, Hamels has lost a bit on his fastball and has adapted by using his cutter more often. Last season was his worst since 2009 and he got off to a rough start this year. He’s put together four straight solid starts, including seven one-hit innings vs. the Astros last time out. His 25.1 percent strikeout rate is a career high and his 9.3 percent walk rate is a career worst. Hamels’ fellow 34-year-old follows him up as Doug Fister gets the call on Wednesday. Fister signed a one-year deal with the Rangers after spending his 2017 season with the Red Sox as a reclamation project. Over the past four seasons, he’s been a part of five different organizations. He’s pitched to a 3.43 ERA, though that’s not as good as peripherals indicate. His strand rate is 13.1 percent higher than last season, when he had a 4.88 ERA. His K-BB rate has gone from 11.5 to 9.3 percent and his soft contact rate is down. He’s kept the ball on the ground, which is reminiscent of his best years with the Tigers, but he’s been lit up by some of the AL’s better offenses this year. While the offense is probably the team’s biggest weakness, the relief crew gives it a run for its money. Of their top five leaders in appearances, only lefty Jake Diekman has an ERA under five. Closer Keone Kela and key reliever Alex Claudio each have 5.06 ERAs slightly better than their peripherals while Kevin Jepsen has been lit up. Jesse Chavez has been solid in multi-inning relief and Jose Leclerc and Tony Barnette have been fine in middle relief. After closing last season, Matt Bush is down in Triple-A. Brandon Mann finally made the majors after 15+ years in the minors. Barnette, Claudio and Chris Martin each pitched an inning yesterday, so the bullpen is rested heading into the series. Martin just returned from the disabled list. Outside of Colon, the only other former Yankee on the current roster is Martin. Martin pitched 24 games for the 2015 Yankees and had most recently played in Japan before joining the Rangers this season. Ronald Herrera, who briefly appeared on the Yankees’ last season before the Rangers claimed him off waivers this offseason, is on the 60-day disabled list. While Colon will get all the attention in this Rangers rotation, the other two starters in this set are more likely to catch attention at the trade deadline. Fister displayed how he can handle the AL East last season while Hamels is more of a known quantity. How will Fister and Hamels handle the Yankees? An impressive showing would be a feather in either man’s cap when it comes to their deadline resume.